Ventilation - Ventilation and insulation play an important role in moisture, condensation, roof life and so much more - truly a key factor in how your home in functioning. Roof - The type, style and general condition are carefully checked. I will inspect the roof covering material, flashing detail, skylights and other roof penetrations and evidence of any water penetration. Attic - A very important inspection. I check the structural integrity, sheathing, general condition, insulation, fan/vents, chimney chase, moisture intrusion, vapor barriers and much more. 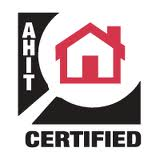 Heating and Cooling - I look at the age, condition and safety of each. In most cases, these are the most used appliances in the home. I inspect the A/C unit inside and outside the home for condition and operation. The furnace is a big ticket item that I don't miss. I look at the type of heating system, approximate age and the general condition. This is an important inspection because of the danger that can arise from system failure. 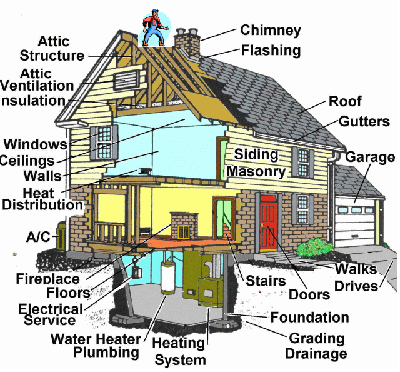 Structure - Probably the most important part of the home inspection. Houses are supposed to stand up, stand still and hold together even though they are subjected to the stresses of gravity, soil movement, wind/water and internal stresses. To insure they do, I perform a complete instection on the inside and the outside of the sturcture. Drainage - Inadequate or reversed drainage and grading cause most water problems. Proper gutters and downspouts are another important part of moisture control. Electrical - From the service drop to the outlets and switches, I closely inspect the electrical system for condition and safety. Plumbing - Type and condition of all accessible and visible fixtures, operation of all fixtures and faucets, backflow devices, anti-siphon and air-gaps, functional water flow, condition of commodes, shower/tub enclosures and much more.